The Customize Windows > Apple > What is Package Manager? Package Manager or Package Management System allows a convenient management of software, which exists in packet form on Like operating system or UNIX Like operating system. It is to be noted that, OS X is Apple’s version of UNIX, being UNIX; Apple Mac with OS X ships with no usual Package Manager or Package Management System installed, OS X actually has a Package Manage, that is GUI based and well known as function – it is App Store. We add some third party Package Manager or Package Management System like Homebrew (This is the basic reason of writing articles like iTerm2, Homebrew and ZSH Installation on OS X). Package Manager or Package Management System said to be the single biggest advancement Linux has brought to the industry (said by Ian Murdock, Founder of Debian Project). The term is commonly used to refer to the Unix-like OS, especially GNU / Linux, since these rely heavily on package management systems to automate the process of installing, upgrading, configuring, and removing software packages. It is a prerequisite for package management that the software the users are installing is present as appropriate packet, typically this is used by the operating system vendor, under the Linux distributions, created, offered and maintained. Softwares are therefore typically distributed installed in different directories of the system. Changes which must make the package manager to install the package on the system are read and converted by it from the package. Package manager detects that the other software(s) is/are required for the functioning (so-called dependency, for example, a program library ), but it is not yet installed, it either warns or attempts to acquire software from a repository , reload and anticipate to install. If an installed application needs to be deleted, the package manager will then return the information of the package to change it based on its configuration and delete the files. Obviously, we can install apt-get package manager on OS X too. Computer systems which rely on dynamic library linking, instead of static library linking, share executable libraries of machine instructions across packages and applications. 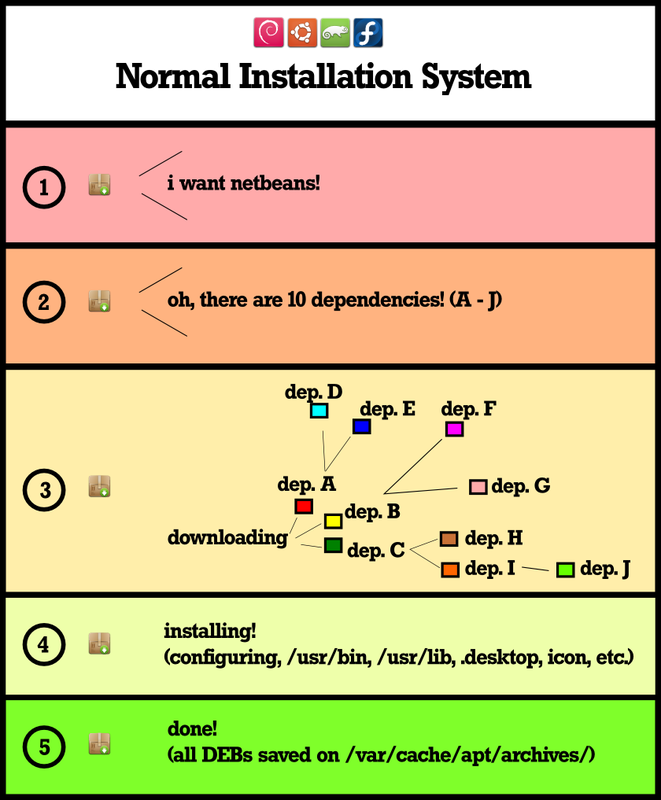 In these systems, complex relationships between different packages requiring different versions of libraries results in a challenge colloquially known as “dependency hell” for Microsoft Windows. This is one of the reason of getting BSOD and various crashes. You probably heard about EasyInstall for the Python programming language, that is an example of Application-level package manager. Cydia is a frontend to a port of apt to iOS, maintained by the jailbreak community. There are different package managers like yum, pacman, dpkg, APT etc. For example, – yum relies on rpm as a backend. Yum extends the functionality of the backend by adding features such as simple configuration for maintaining a network of systems. It is possible to convert one package to another Based on Linux. Tagged With 5 Discuss about packages and various package managers with its commonly used commands , what is package manager , 5 Discuss about packages and various package managers with its commonly used commands in linux operating system , google package management system , is package management system a system software , packet manager , what is the role of a package manager? This Article Has Been Shared 8095 Times! Articles Related to What is Package Manager? Title: What is Package Manager? Cite this article as: Abhishek Ghosh, "What is Package Manager?," in The Customize Windows, March 2, 2014, April 21, 2019, https://thecustomizewindows.com/2014/03/what-is-package-manager/.